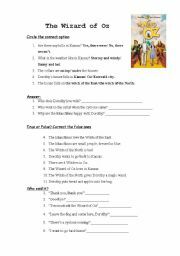 This is a worksheet on The Wizard of Oz for kids aged 8-13. It´s a TRUE/FALSE activity and there´s also an activity where sts have to put the story in order. It´s advisable to do it when they finish reading the book since it gives them some practise for going public. Hope you like it! 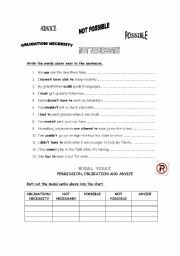 This worksheet presents modal verbs by first understanding how they work and then introducing the rule. I had to create this from scratch since nothing I found was to my entire satisfaction. I hope you enjoy it! 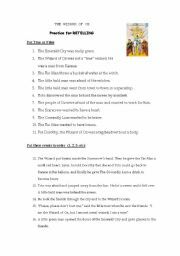 This worksheet deals with chapter one of The Wizard of Oz. It has got a variety of activities to get the students started. I hope you enjoy it! 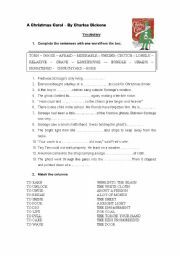 A worksheet on general vocabulary and plot of the well known classic "A Christmas Carol". Hope you enjoy it! This song, as you know, explores the topics of feelings and friendship. It´s ideal to work with children and adolescents. Hope you like it! 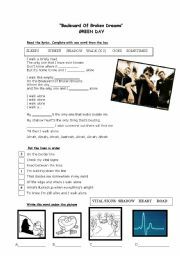 Boulevard of Broken Dreams has simple language for teens who have a beginners level of English. It gives them a great sense of success since they can complete the lyrics without major problems. I hope you find it useful! 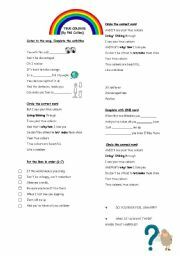 This is a worksheet especially designed for those teachers preparing students for the Cambridge KET. 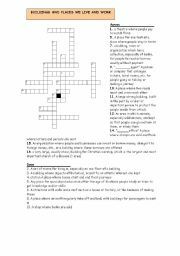 It´s a crossword with typical vocabulary that candidates are required to know. I hope you find this activity useful! Discussion on the ending of the book (penguin ed. level 5). Working on specific vocabulary and some gap filling exercises. I hope you enjoy this worksheet! 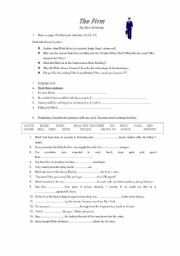 This is a worksheet for young students who are learning the 3rd person singular form of the verb. It is engaging and highly effective. I hope you enjoy it! 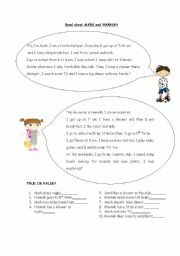 This is a worksheet on Winnie in Winter to practise comprehension. I hope you enjoy it!